A working meeting of Cavid Qurbanov, Chairman of Azerbaijani Railways CJSC, and Oleg Belozyerov, President of the Russian Railways took place in Moscow on 8 December 2016. The issues discussed during the meeting were focused on the development of the North – South international transport corridor (ITC), including cargo base of the route and the project of the railway line construction from Astara (Azerbaijan) to Rasht (Islamic Republic of Iran). Oleg Belozyerov pointed out that the development of North – South international transport corridor has been actively progressing and that the RZD JSC is ready to improve the tariff policy on this route in order to set up competitive conditions for the transportation, in particular, to consider the possibility of goods carriage by the end-to-end rates. 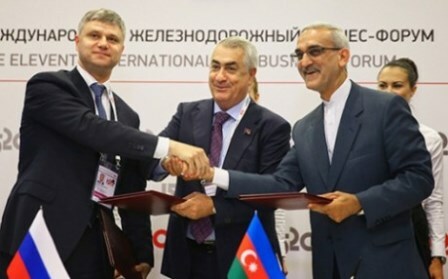 The pilot trial multimodal shipment of containers took place in September along the North – South corridor route from India to Russia through Iran and Azerbaijan. This is the route where further container goods transportation is planned to be organised in the future on a regular basis. During the meeting the parties also discussed some possible additional joint efforts towards increasing the attractiveness of the passenger traffic between the two countries. From 9 till 10 April 2015 the capital of Mongolia, Ulan Bator, welcomed the representatives of China, Mongolia and Russia who met to discuss further cooperation in the field of railway transport. 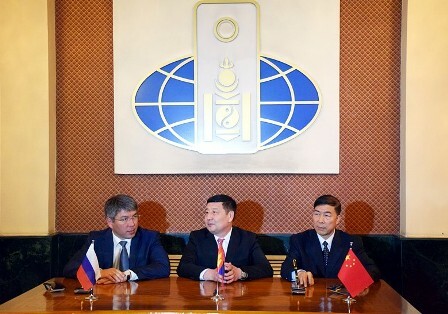 The delegations were headed respec­tively by Deputy Head of PRC State Department for Railways Fu Xuanyi, Vice-Minister for Roads and Transportation of Mongolia H. Yerzhan and Deputy Minister of Transport of the Russian Federation A. Tsydenov. The Parties exchanged opinions concerning cooperation between the three countries in the field of railway transport, and reached full unanimity. It was noted that the Parties support and will develop rail transit transportation, increase in transportation volumes on the existing railway lines, study a possibility to found a tripartite joint transport and logistics company, take measures to regularly develop and increase the capacity on railway lines in the direction of Ulan-Ude -Naushki - Sukhe Bator - Zamyn Uud - Erlian - Jining. The Parties also supported the development of full cooperation between educational institutions in road and transport areas, organisation of experience exchange, preparation, professional development and retraining of teachers and personnel, as well as the intensification of collaboration in scientific and research area. Participants of the meeting emphasised that by maintaining the format and 'platform' of such kind of a meeting it will be possible to tackle promptly the challenges of railway transit traffic development, which finally will help to work out the decisions corresponding to the interests of the three countries. Following the results of the meeting a protocol was signed. As part of Russian Prime Minister Dmitry Medvedev's official visit to the Socialist Republic of Vietnam, an agreement on cooperation between Russian Railways and the Vietnamese Railway State Company was signed in Hanoi on 7 April 2015. On the Russian side, the agreement was signed by First Vice-President of Russian Railways Vadim Morozov, with General Director of Vietnam Railways Vu Ta Tung signing for the Vietnamese side. The agreement provides for cooperation in several areas: logistics, infrastructure projects, cooperation within international organisations, and the exchange of experience and scientific and technical information. The construction of a railway line in the south of Vietnam, designed jointly by the An Vien company, Vietnamese Railway, and Russian Railways, and currently under consideration by the Government of Vietnam, may constitute a joint pilot project in the sphere of infrastructure development. Am 31. Oktober 2012 fand der Arbeitsbesuch des Außerordentlichen und Bevollmächtigten Botschafters der Republik Kasachstan in Republik Polen, Eric Utembajew in Sławków statt, wo er sich mit der Arbeit des logistischen Terminals "Euroterminal" bekannt gemacht hat. Im Verlauf des Besuches hat das Treffen mit den Vertretern der "Euroterminal Sławków» GmbH und „PKP LHS“ GmbH stattgefunden, an der die Präsidenten und die Aktionäre der Gesellschaften, sowie Mitglied des OSShD-Komitees von Republik Kasachstan, die Vorsitzende der OSShD-Kommission für Güterverkehr Zubajda Aspayeva teilnahmen. Die Teilnehmer des Treffens haben die Fragen über die Nutzung des Transitpotentials Kasachstans und Polens und der Organisation in Zukunft des Containerzügeverkehrs aus Kasachstan, China und den Ländern der Mittleren und Südostasiens nach die Länder Europas durch die Containerterminale „Euroterminal Sławków“ und die „PKP LHS“ besprochen. Die Nutzung dieser Reiseroute wird zulassen, die Zustellung der Gütern mit den Zügen ohne Fahrgestellwechsel und Überlastung an der EU-Grenze tatsächlich bis zu Katowice (Polen), in der unmittelbaren Nähe von Tschechien, der Slowakei, Österreich, Ungarn und Deutschland zu verwirklichen, was die Zeit der Zustellung der Güter wesentlich verkürzten wird und die Attraktivität und die Effektivität des Eisenbahntransports im transkontinentalen Verkehr erhöht. On 12 September 2012, at the State Kremlin Palace in Moscow,  , a ceremony took place to reward and honour winners of the 7th International Reward for the Transport Sector named as “Golden Chariot” which proved to be the most prestigious and independent expert throughout Russia and abroad in the field of identification and assessment of best enterprises and organizations in the transport sector. The rewarding ceremony was attended by Vice Speaker of Russia’s State Duma (lower Chamber of the Russian Parliament) Valery Yazov, Minister for Transport & Communications of Belarus, Ivan Scherbo, State-of-Secretary and Deputy Minister for Transport of the Russian Federation Sergey Aristov and other official persons. This year Organization for Co-Operation between Railways is among the winners which have obtained a reward in the special nomination “For Strengthening the International Relations” i.e. a statuette in the shape of three horses harnessed abreast and Diploma of Honour. On behalf of OSJD Committee’s Chairman Tadeusz Szozda, the Reward was received by OSJD Committee’s Secretary Kalman Somodi. The ceremony in the Kremlin began with one minute’s silence in remembrance of all the victims of Yaroslavl plane crash. This year companies from different regions of the world have obtained their rewards together with Russian enterprises. Traditionally, Chairman of Honour of the Reward Presidium, Vice Speaker of State Duma Valery Afanasyevich Yazov and State-of-Secretary and Deputy Minister for Transport of the Russian Federation Sergey Alekseyevich Aristov opened the ceremony. - Minister for Transport, Information Technology and Communications of the Republic of Bulgaria Ivaylo Moskovski. - “Popularization of Transport Branch”. After the high-level ceremony in the Kremlin the “Golden Chariot” reward moderators began preparations for a new event with respect to distribution of rewards to the best national and foreign companies engaged in the transport sector – already early in October (on 2 – 4 October) this year – Berlin was planned to host the reward ceremony for the winners of “Golden Chariot” International Public Reward in the transport sector exactly on the opening day of the Global Aviation Forum i.e. on 2 October within the framework of 17th Global Forum on development of air transport, with honouring the best national and international airline companies and airports. “Ural Airlines”, international airport “Tolmachevo", company “Maxilog – integrated logistics systems”, OJSC “First Cargo Company” (OSJD’s Affiliated Enterprise), Federal state unitary enterprise “Rosmorport”, companies “Transcontainer” and scientific-production association “Mechanoservice – NKMZ”. Let us remind you that the first ceremony for the “Golden Chariot” Reward took place in 2004, and two years ago representatives from foreign transport companies began to submit their applications to the Steering Committee. The attention paid to the reward by the transport community of the world did not remain unnoticed. Russia’ Ministry for Transport and State Duma’s Committee on transport made a proposal to change the federal format of the project making it international. The regular meeting of the Reward Presidium which was held late in 2010 unanimously adopted the respective decision. So, in 2011 the “Golden Chariot” Reward was given second birth, this time it was born as International Public Reward in the transport sector. On the one hand, this outstanding event once again acknowledged the significance of the project, and on the other hand, it placed enormous responsibility on the Steering Committee, Expert Council and Reward Presidium. Right after the Reward’s status was changed, the leading transport companies from Germany, France, Spain, Brazil and many other countries began to submit their applications to the Steering Committee. Every passing day the number of applications kept growing, and the Steering Committee decided to reward the first winners of the competition. On 11 April 2011, the first rewarding ceremony for the winners of the International Public Reward “Golden Chariot” was held in Dubai, United Arab Emirates, within the framework of the 59th World Congress and Mobility & City Transport Exhibition of the International Association of Public Transport (UITP)”. OSJD’s rewarding within the framework of this Reward as if sums up the painstaking and purposeful activities of the organization and all its member railways for the 55 year period, marking its enormous contribution to development of the railways, international railway traffic and an increase in competitiveness of the railway transport.